For Day 15 of this series, we’re organizing dressers used by adults. If you’re just joining us, you’ll find the series overview here, including links to previous missions like the one on organizing kids dressers. Ready to ROCK? Let’s do this. Removing clutter from a dresser makes it easier to organize your stuff. 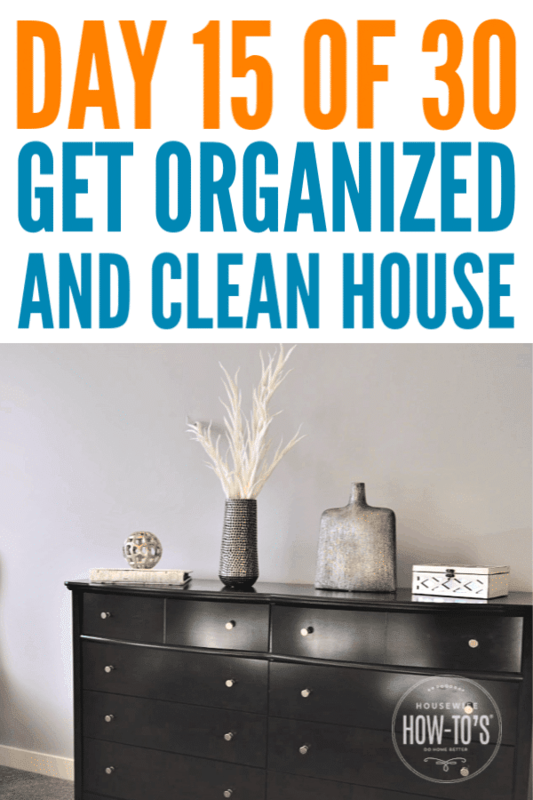 We’re focusing on the contents of your dresser today and will deal with the things sitting on top of it on Day 17 when we organize your bedroom. For now, ignore what’s on top — unless it’s a pile of clothing. Now, let’s get serious about that third pile. If that third pile is still large, it’s time to honestly evaluate why you’re holding onto an item. Some of the more common reasons — and solutions — are below. “But it’s in good shape!” Many of us get uncomfortable parting clothing that’s still in good condition. After all, we paid for it — or someone did. That money is only wasted if no one wears it. Donating it gives someone the chance to wear it, so it’s no longer a worthless thing cluttering your dresser drawers. “It’s too big/too small for now.” This holdover from childhood was ingrained in many of us, making it hard to let go of clothes that don’t fit. But, unless you’re avidly pursuing a diet or exercise regimen (and I’m not saying you should! ), chances are fashions will change before your size does significantly. And if your shape does change? Well, that’s when you’ll want new clothes to flatter it. “I might wear it if…” This is the kind of “someday stuff” we discussed on Day 3 when cleaning off our dining tables. This can be some of the hardest stuff to let go of, because it requires acknowledging that we’re not currently the type of person who’d wear such a thing and may never be. “But it’s sentimental.” Sometimes clothing has a sentimental value that has nothing to do with whether you can ever wear it again. Don’t throw away your memories, but don’t feel like you need to give them space in your dresser, either. Turn old t-shirts into quilts. Frame the “Bride” and “Groom” t-shirts you and your spouse wore on your honeymoon. Be creative! 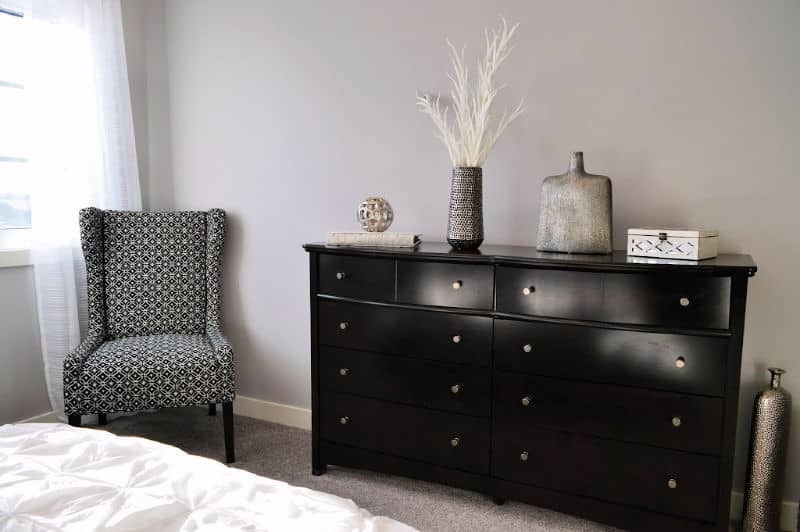 Organizing dressers is about making them easy and efficient to use. You want to be able to find what you’re looking for, and you need to be able to get it without making a mess. It’s nice when it also looks pretty, too. For that reason, I’m honestly not a fan of the trend to “file” folded t-shirts vertically. I know it looks beautiful when you first do it, and for a few days after that, too. But unless you’re washing, folding, and putting away clothes every couple of days, you get to a point where the drawer is empty enough that the remaining t-shirts flop over anyway. Here are a few tricks to organizing dressers that apply whether you decide to file your folded clothes vertically or keep them in horizontal piles. Separate out-of-season items. Keep the contents of your dresser pared down (and therefore neater) by storing out-of-season clothing somewhere else. A plastic covered bin in the basement or on a closet shelf works. Short on space? Try zippered fabric storage bags under the bed to keep your seasonal stuff dust-free but out of sight. Hang your pants — including leggings. Jeans and other pants take up a lot of drawer space. Although leggings are lightweight, like pants they are a major component of your outfit. Hanging them keeps them visible, making it easier to choose your LOTD without rummaging around in your drawers. Organize the rest by type. 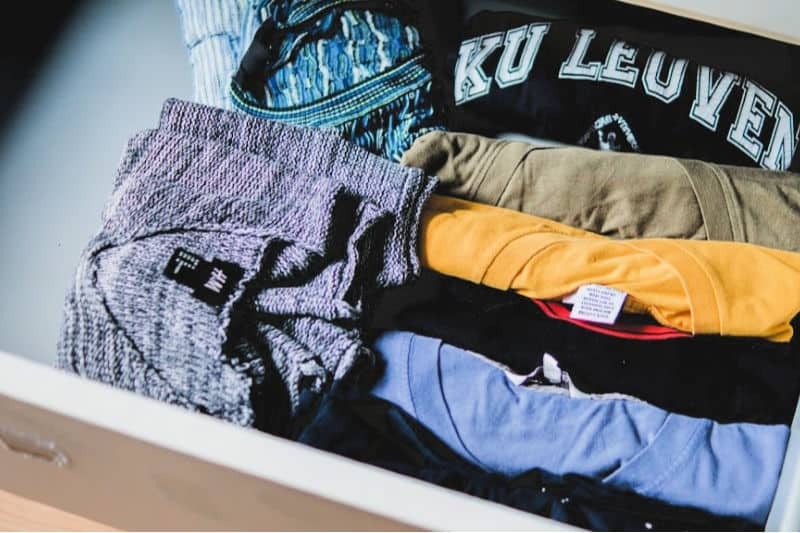 In general, the kind of clothes stored in a dresser are delicates, underwear and socks, t-shirts and tank tops, workout clothes, and pajamas. If you live in an area with cold winters, you might also store sweaters in your dresser, in which case you should swap them with tank-tops when they’re out of season. Store things by function. It’s probably obvious that keeping similar types of clothes in the same drawer makes getting dressed easier. Your bras and underwear, for instance, can share the drawer with socks. Put t-shirts and tank-tops (or sweaters) in a drawer and you’ll be able to grab a top in a jiffy. You get the picture. Dresser drawers stay neater when divided into sections, especially if you need to store different types of clothes together. You can do this visually — and then straighten the sections each time you put away clothes — or with drawer inserts. A general rule of thumb is to divide smaller drawers in halves, and larger drawers in thirds. So, when putting away neatly folded clothes, you’re either doing it in two stacks or three. Shallow drawers are best for things like bras and undergarments. Deeper drawers should hold bulkier items like t-shirts and tank-tops or sweaters, workout clothes, etc. It’s not a bad idea to make a note of your dresser drawer measurements so you can keep an eye out for containers at the Dollar Store or garage sales, too. While your dresser is empty, go ahead and pull it out from the wall. Dust the back of it, along with the wall and baseboard behind it. Put the dresser back before filling the drawers. Keeping on top of what we’ve already ROCKed should be turning into a habit by now. If you’ve been diligent about doing it at the end of each day’s mission, then you’ve already discovered it only takes 15 or so minutes each day. But, wow, what a difference those minutes make, right? So, grab a trash bag and a box, and buzz through the areas we’ve already ROCKed. Toss trash where you find it, and toss things that are out of place into that box. Entryway and coat closet: Everything hung up? Shoes put away? 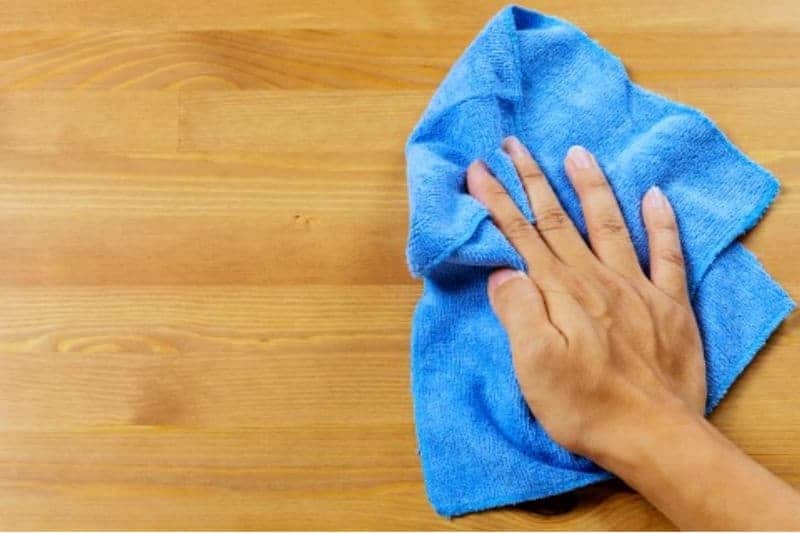 Dining table: Wipe the top. Tuck in the chairs. Kitchen: Put away things that belong in the cupboards. Wipe the counters. Sweep. Put out a clean towel. Family room/living room: Straighten pillows and throw blankets. Tidy tabletops. We are going to tackle your closet tomorrow, so brace yourself. If you need a pep talk, come join our Do Home Better group on Facebook. We love exchanging tips and cheering each other on!